Losing anything important to your everyday life is an inconvenience, especially your keys! 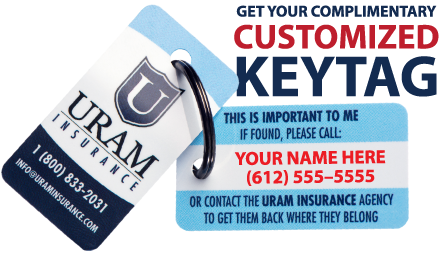 Increase the chances of getting them back quickly with the RECOVERY KEYTAG™, exclusively from Uram Insurance. Put one on everything that’s important to you: your key ring, backpack, purse, luggage, in your child’s pocket (or on their shoes) or attach to anything else you’d like to be returned if lost. Whatever it is, we’ll help it get back where it belongs! Request your FREE Recovery KeyTags™ NOW! Please tell us what you want printed. How many Recovery KeyTags™ would you like to receive? Will the information you entered above be the same on all of them? Sign me up for your newsletter and send me the FREE KeyTags! Insurance coverage cannot be bound, cancelled, or modified in any way via communication on this website.